This is the Appointment Schedule with all the details you need to know about scheduled patients. It also includes an audit report so you can compare scheduled patients to recorded fee slips and know that their recall dates have been updated. Also included in the patient demographic information and financial status of the scheduled patients, so your staff knows their phone numbers, whether they have been sent to collection or are a Cash Only patient. If you accept insurance plans that require Eligibility or Authorizations in advance, quickly find those scheduled patients, their authorization number and the insurance info. For those of you wanting a schedule report with a larger font, this one is for you. For more information on how this eyereport can increase revenues, save staff time and manage your schedule, watch our 5 minute video! Select Appointments by Appointment Month, Day or year. Other Filters include; Location, Provider/Resource. 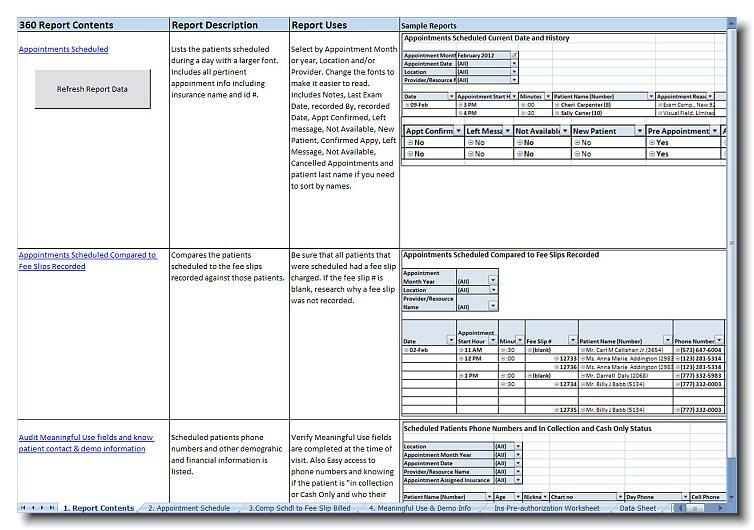 This report gives all of the remaining detail for the scheduled patients that your staff may need to contact them or know information about them when they visit your office. Compare the patients scheduled to the fee slips recorded against those patients. Be sure that all patients that were scheduled had a fee slip charged. If the fee slip # is blank, you can research why a fee slip was not recorded. The benefit of this report is so you can check that all scheduled patients were billed after their visit. Use this worksheet to select scheduled patients whose insurance requires authorization or elibility, if the authorization number is blank you'll need to get one. Select the patients by Appointment Date or the date an appointment was created. By selecting the date it was created, your staff can stay on top of the authorizations by tracking new appointments added daily, not just by selecting a single scheduled date.